Host your next retreat at Punta Mona! Let the wild jungle and private Caribbean beaches be the backdrop for your transformative event, workshop or immersion. We regularly host groups of 15 to up to 150 people, providing housing, organic meals, and open-air classroom/event space. When you’re here, you’re family – your group will be supported and nourished by our loving community of kind space-keepers from around the world. Start your morning with yoga in our beachfront shala, listening to the waves and the birds. 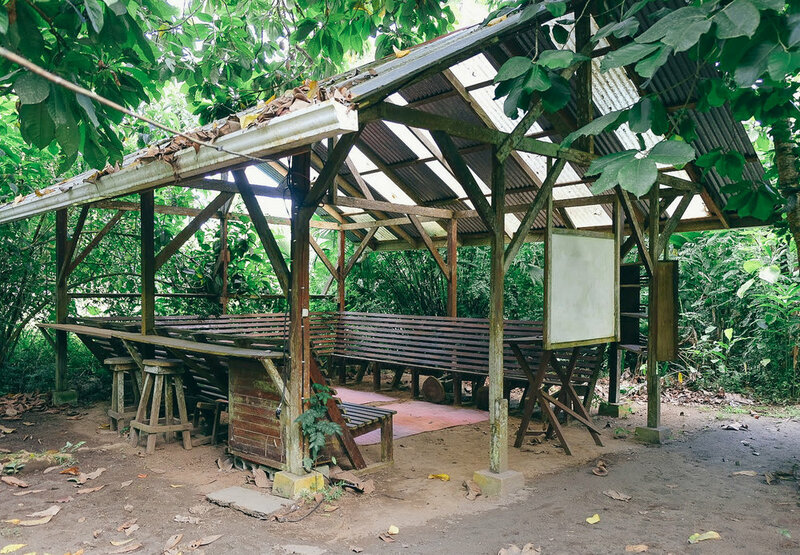 Teach your workshop in our outdoor classroom, surrounded by banana trees and medicinal plants. 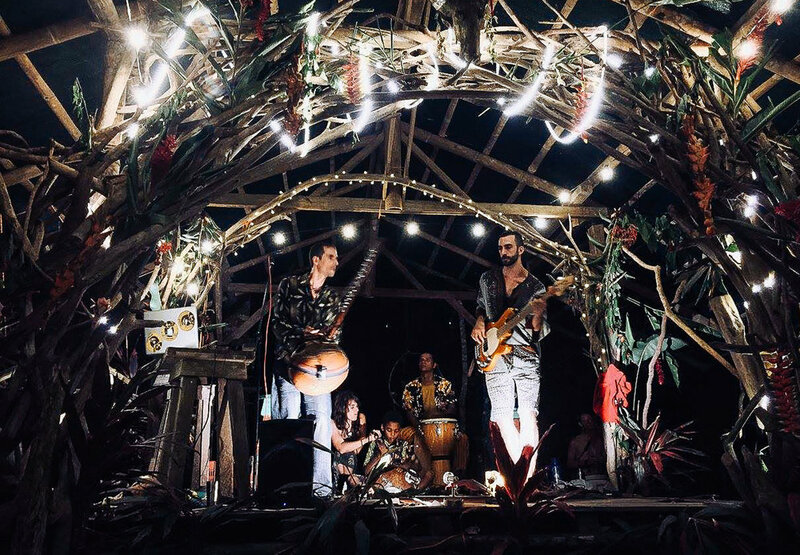 End your day with cacao and live music at our jungle stage deep in the trees. The following spaces are available to reserve for your retreat or gathering. 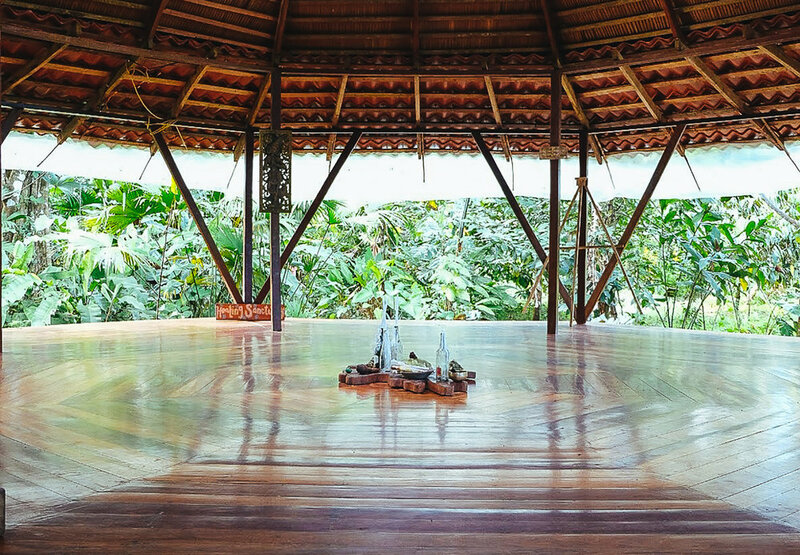 Our open-air yoga shala has a smooth wooden floor, high-ceiling, and is completely surrounded by jungle plants. We have around 20 mats and wooden blocks (although some of our mats have gotten a bit “jungly” over the years). Right in the middle of our farm we have an awesome, outdoor classroom, that can seat approximately 25 students. Our main community house has plenty of lounge space for relaxing or hosting classes/workshops. There are two large tables upstairs and one downstairs that can sit roughly 16 people each, and couches, cushions and hammocks throughout the house. Our stage and covered dance floor provides a space for concerts, classes, fire circles, and ceremonies. The stage has electricity for lighting and sound, and we have a portable speaker system that we often set up for larger concerts and events. Local and international musicians such as Rising Appalachia, the Human Experience, etc. have performed at our Rootdown Stage. The community kitchen can feed up to 150 people at one time. We prepare all of our meals from scratch each day, using ingredients fresh from our farm or neighboring farms. We are mostly vegetarian, always offer vegan options, and can accommodate special dietary needs such as raw, gluten-free, etc. with advance notice. 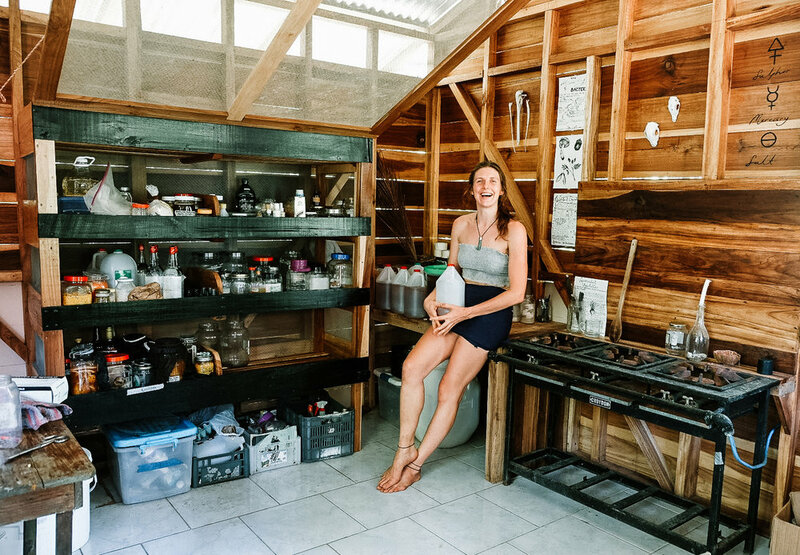 Our brand-new Alchemy Lab and elixir bar provides additional lounge space for guests, and tinctures, tonics, and elixirs for purchase. The Alchemy Lab can also be reserved for workshops in medicine-making with one of our herbal witches. We can’t wait to welcome you and your guests to the Punta Mona family!